When people think about fish in the Roman world, they often think about garum: a sauce made from salted and fermented fish that is similar to Thai fish-sauce (‘nam pla’). As well as this, we do also know of recipes for fresh fish from Apicius, for example baked bream and mackerel stuffed with mint, honey and hazelnuts. We also know that Romans ate salsamenta: salted fish. How much do we know, then, about where fish were bred and salted? In this blog post, I am going to focus on this question for a few sites in the Roman Near East (broadly the modern Middle East). 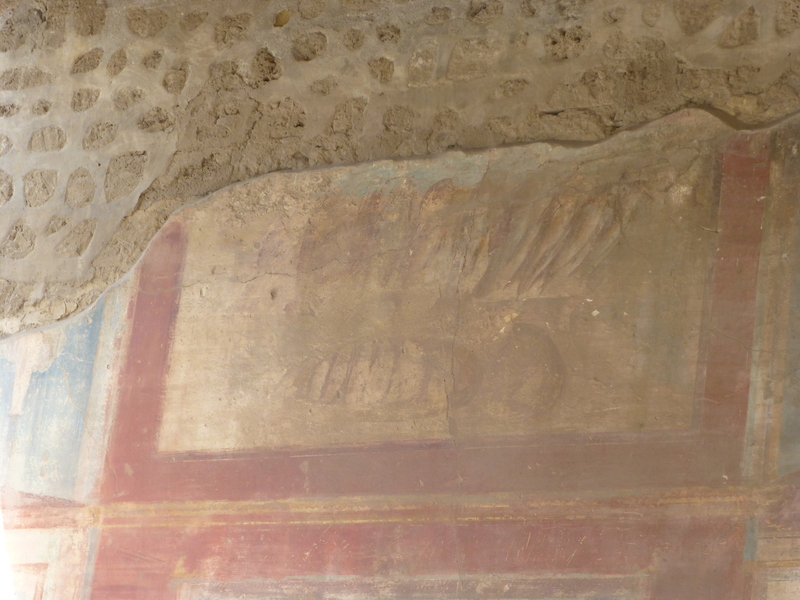 Painting of fish in the market building at Pompeii, where fish bones were also found in the drain. Identifying fishponds and fish-breeding sites archaeologically is not very easy as most vats and ponds could have other uses as well. We do, though, have a useful written source, Columella, who tells us that jars (‘cells) set into the walls were essential in a fish-breeding pond (De Re Rustica 8.1.3, 17.1-6). Identifying this special feature is much easier and has actually been done for some sites in the Roman Near East. Such jars, set horizontally into the walls, were found at Khirbet Sabiya (300 jars: Ayalon 1979:175-177, 179), Caesarea (6th century: 60 jars (Gibson 1991:41) and Tel Tanninim: 16 Gaza amphorae (Stieglitz 1998:63-5)) and Sataf (Mango 2002:325). A similar arrangement was found in the south-eastern reservoir at Andarin in Syria. Instead of jars or amphorae rectangular recesses were found at the base of the reservoir walls, possibly numbering 200 (Mango 2002). The example from Andarin was very large measuring 61 m long x 61 m wide x 3 m deep because it also acted as a reservoir for irrigation supplies. The freshwater n this pond makes it possible that catfish were bred there. Catfish were the only freshwater fish bred in fishponds cited in ancient sources, such as Apicius and Pliny (André 1981:109-113); in addition, catfish bones have been identified in the assemblage retrieved from the cistern Andarin bathhouse, though not from the reservoir itself (Mango 2009:75). Columella also recommends that the water for the fish should circulate (De Re Rustica 8.1.3, 17.1-6), which is what we find at most of these sites. The examples from Dor seem to have been fed by seawater (Raban 1995:343). A pipeline branch (Channel E) from the Caesarea High Level aqueduct channel A fed the reservoir at Tel Tanninim (Stieglitz 1998:57-8). Spring water from a spring flow tunnel at Ein Bikura, Sataf fed a pool with two rows of ceramic jars in its sides with mouths towards the pool (Gibson 1991:41). In all of these cases the nature of the water supply means that a constant supply of circulating water was ensured (see Columella De Re Rustica 8.1.3, 17.1-6). There are also examples from the Near East where we don’t have jars, but think that fish might have been bred in these installations. These are some paired rock-cut tanks from Dor (Raban 1995:343) and Beirut (Thorpe 1998-9: 36-38), which had no recesses or jars. It has been suggested that the Beirut tanks, which were lined with opus signinum (waterproof concrete), might have been holding tanks for holding the catch after the return of the fishing vessels. This is because the vats were in close proximity to a cove to which they were linked by a flight of steps. A similar function is also possible for the Dor installations as they were also situated very close to the coastline. Alternatively, it is possible that these were vats for the production of salsamenta where the flesh of the fish was cut up and salted. While there is evidence that fish were salted in the eastern Mediterranean, archaeological evidence has been lacking so far, prompting the idea that maybe the process was done in large ceramic jars, such as pithoi or dolia (Wilson 2006; Curtis 1991:112-8, 129-147). Salting vats in the western Mediterranean (in particular Spain, Portugal and Morocco) were remarkably similar and almost universal in construction, though they varied in size and depth (Trakadas 2005:69-72). While the rectangular or square tanks in the western Mediterranean were usually built of brick or rubble, rock-cut examples are known from Portugal at Punta de l’Arenal and Praia de Angeiras. These Portuguese examples were not joined together as was usual elsewhere, which is similar to the possible salting vats from the East. 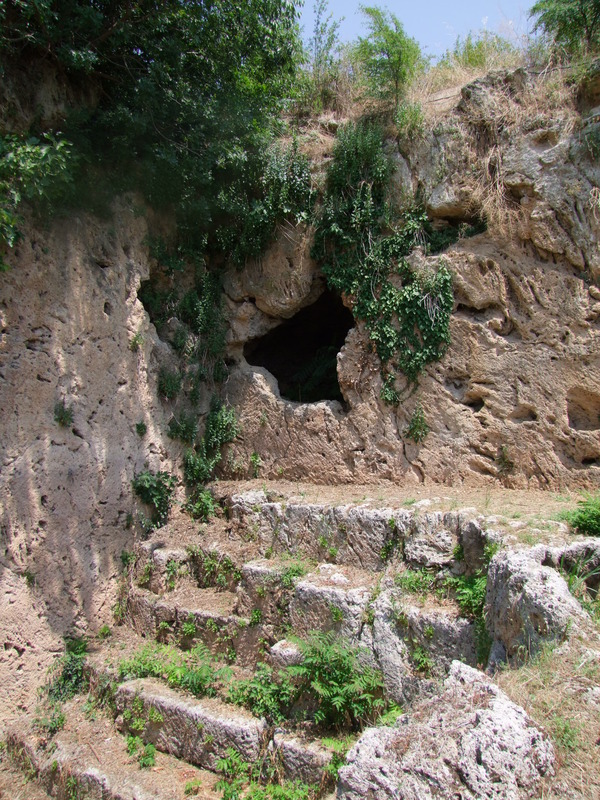 The western examples were faced with opus signinum, as at Beirut. So, the pairs of vats at Beirut and Dor illustrate some, but not all, of the common traits found at the sites in the western empire. It is possible, but not definite, that these installations may be, then, the first fish-salting sites identified from the eastern Mediterranean. André, J. L’Alimentation et La Cuisine à Rome (Paris: Belles Lettres, 1981). Ayalon, E. “The jar installation of Khirbet Sabiya,” Israel Exploration Journal 29 (1979), 175-181. Gibson, S. “The Sataf project of landscape archaeology and the Judean hills: a preliminary report on four seasons of survey and excavation (1987-1989),” Levant 23 (1991), 23-54. Mango, M. “Fishing in the desert,” Palaeoslavica 10/1 (2002), 323-330. Mango, M. “Baths, reservoirs and water use at Androna in late antiquity and the early Islamic period,” in Bartl, K. and al-Razzaq Moaz, A. (eds) Residences, Castles, Settlements. Transformation Processes from Late Antiquity to Early Islam in Bilad al-Sham (Rahden: Deutsches Archäologisches Institut, 2009), 73-88. Raban, A. “Dor-Yam: maritime and coastal installations at Dor in their geomorphological and stratigraphic context,” in Stern, E. and Berg, J. Excavations at Dor: Final Report (Jerusalem: IES, 1995), 285-354. Stieglitz, R. R. “A late Byzantine reservoir and piscina at Tel Tanninim,” Israel Exploration Journal 48/1-2 (1998), 54-65. Thorpe, R. “Bey 007: the souks area: preliminary report of the AUB/ACRE project,” Bulletin d’Archéologie et d’Architecture Libanaises 3 (1998-1999), 31-55. Trakadas, A. “The archaeological evidence for fish processing in the western Mediterranean,” in Bekker-Nielsen, T. (ed.) Ancient Fishing and Fish Processing in the Black Sea Region (Aarhus: Aarhus University Press, 2005), 47-82. Wilson, A. “Fishy business: Roman exploitation of marine resources,” Journal of Roman Archaeology 19 (2006), 525-537. This entry was posted in Ingredients, New Research and tagged Andarin, Beriut, Caesarea, Columella, Dor, fish, garum, ponds, Portugal, salsamenta, vats on October 24, 2014 by zkamash2013. 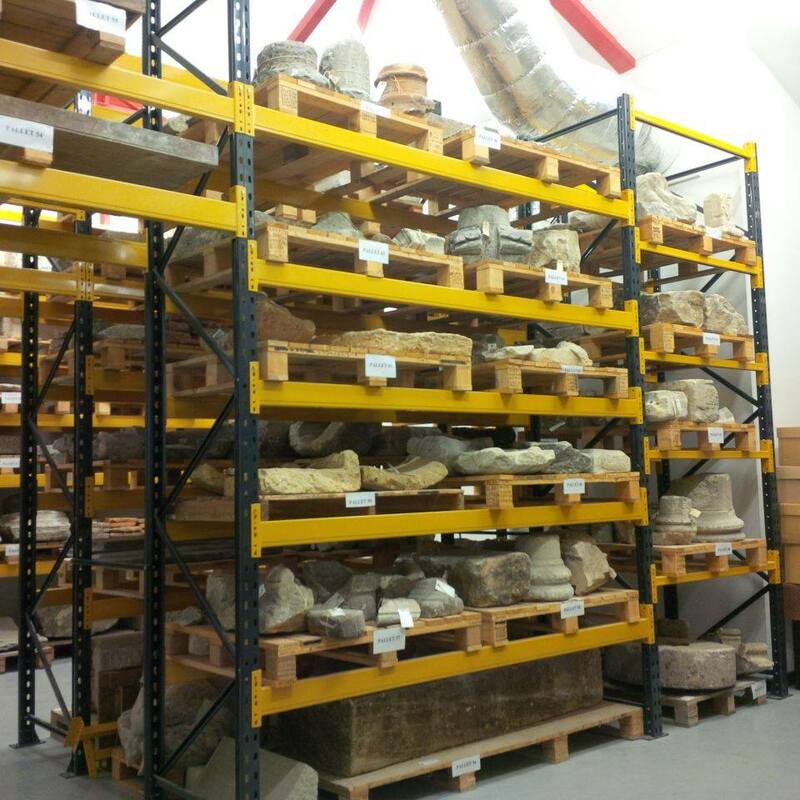 We had our first visit to Corinium museum’s storehouse, Northleach, yesterday. I’m not sure what everyone else pictures when they think of a museum storehouse, but I had envisioned a grey metal warehouse set in an industrial complex, poorly lit, cold and filled with dusty boxes of artifacts set on old wooden shelves. That is certainly not Northleach. The storehouse is in fact a modern building in the shape of an old barn (metal but brightly coloured instead of grey) set in the lovely Cotswold countryside. 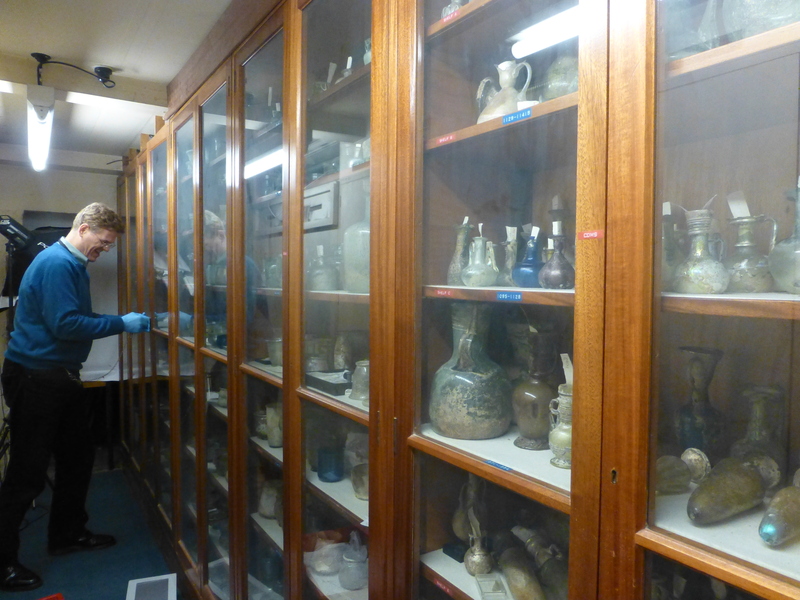 It’s clean, bright and spacious and the Corinium team has meticulously catalogued and organized all the artifacts. In addition to the Roman material there’s a large room filled with old farm equipment and upstairs everyday objects from the 18th and 19th centuries. All in all, a great place to spend the day searching amongst the shelves and boxes for the perfect objects to put on display! The morning was spent looking at animal bones, human skeletons, samian ware pottery, archaeobotanical remains and oyster shells. After lunch we realized that we had gotten a little too excited (as archaeologists do when left in a storehouse full of nice, clean objects) and the workroom was now filled with dozens of boxes. Zena and Alison managed to get us all organized and the hunt continued. The afternoon produced the best and most unexpected finds. In a box full of animal bones from Cirencester Zena came across the scapula (shoulder blade) of an animal that had been pierced so that the meat could hang and dry. I (Erica) was given the task of finding display objects from the Roman fort of Leaholme and let me tell you, this was no out of the way, forgotten about part of the Roman Empire. There were numerous boxes of beautiful samian ware vessels to sort through, all of which would have been imported from Roman Gaul. One particularly nice fragment had a relief of a cupid holding a bunch of grapes. 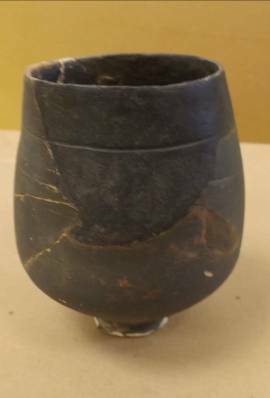 There were also several locally made ceramic cups and jars, and colourful fragments of wall plaster to examine. Although Dan soon decided that we had enough material from Leaholme, I couldn’t resist looking in the box labelled fine wares. Luckily my curiosity paid off and inside was a complete drinking cup! Around 3:30 we decided that we definitely had enough material (since we haven’t even started looking at the material housed at Corinium museum yet), had some tea and called it a day. On November 19th we’re going to be heading to the museum to look at the material housed there, so watch out for that blog! This entry was posted in Corinium Exhibition and tagged animal bones, Corinium Museum, Leaholme, samian ware on October 23, 2014 by ericarowan. Sounds delicious! A single mulberry tree grows in Forbury Gardens, Reading, and this video shows how eating the fruits creates strong memories for locals. My first mulberry was from a tree growing outside Aristotle’s Cave, Naousa in northern Greece, on an archaeobotanical field trip. The fruit was soft, sweet and delicious. Mulberry trees (Morus nigra) are small spreading trees. They probably originated in Iran, but were cultivated by the Ancient Egyptians, Greeks and Romans (Vaughan and Geissler 2009). In Italy, Pliny wrote that little improvement was made to the mulberry tree, and varieties grown in Ostia, Tivoli and Rome were all the same (NH XV.27). The pips of mulberries, like fig, are tough, and would survive well in mineralised (latrine pits) and waterlogged sediments (wells, pits). Yet archaeobotanical studies of settlements across the Roman world have shown that mulberry pips are quite rare. 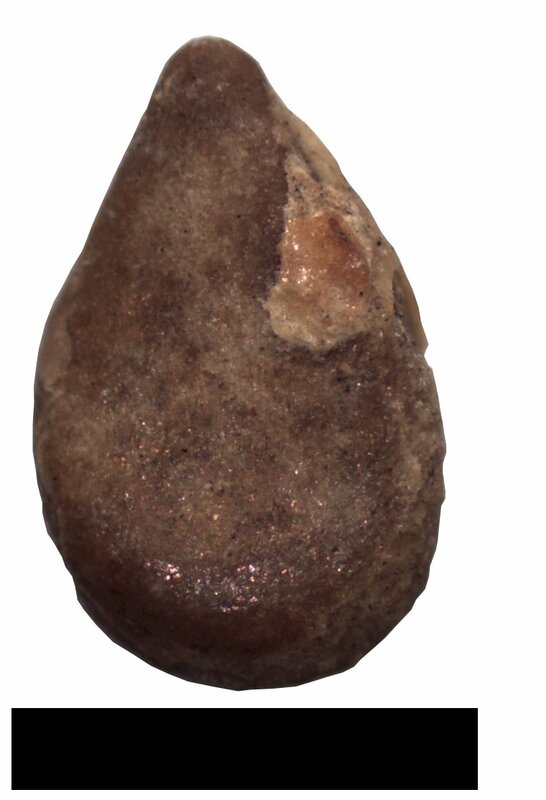 Mulberry pips have been identified from some sites in Pompeii which have been sampled for plant remains. The fruits pips have been found from the House of the Vestals and the House of Hercules’ Wedding in Pompeii (Ciaraldi 2007), and have also been recovered from the Cardo V sewer in Herculaneum (Rowan pers. comm.). Mulberry pips are also rare in other parts of the Empire, in comparison to fruits such as fig and grape. They have been found from archaeological sites in Cologne, and a few settlements near the Rhine. Livarda has suggested that there may have been a connection between the military and mulberries (Livarda 2008, 117). In Britain, mulberry seeds have been found at London, Silchester and York, indicating that only wealthy urban dwellers had access to these fruits. Mulberry fruits have also been found from the other side of the Roman Empire. 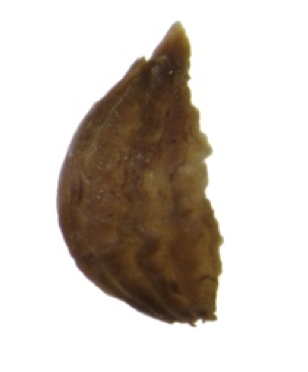 Desiccated pips have been recovered from the Roman quarry settlement of Mons Claudianus in the eastern desert of Egypt (Van der Veen 2001, p 194). The rareness of mulberries in the Roman period was probably because of the same reasons as today – the fruits were very difficult to transport. Galen, the Greek physician, described how the fruits could not be dried (Grant 2000, p 110), whilst in Apicius, it is described how the Romans attempted to preserve the fruits in wine and in their own juice, but with little success (Vehling 1977, p 52). Most experts on Roman plant remains think that occasional mulberry trees would have grown in urban centres, like Silchester, Cologne and Pompeii, much like in modern Reading. The taste of mulberries may have been on occasional delight for those in the Roman period, as today. Do you remember mulberries? We would love to hear your memories! Ciaraldi, M. 2007. People and Plants in Ancient Pompeii : a New Approach to Urbanism from the Microscope Room: the Use of Plant Resources at Pompeii and in the Pompeian Area from the 6th century BC to AD 79. London: Accordia Research Institute, University of London. Grant, M. 2000. Galen on Food and Diet. London: Routledge. Livarda, A. 2008. New temptations? Olive, Cherry and Mulberry in Roman and Medieval Europe. In S. Baker, M. Allen, S. Middle, & K. Poole (Eds. ), Food & Drink in Archaeology 1 (pp. 73–83). Totnes: Prospect Books. Van der Veen, M. 2001. The botanical evidence. In D. Peacock & V. Maxfield (Eds. ), Survey and Excavations at Mons Claudianus 1987-1993, ii, The Excavations: Part 1 (pp. 175–222). Cairo: Institute Francais d’Archaeologie Orientale du Caire. Vaughan, J. and Geissler, C. 2009. The New Oxford Book of Food Plants. Oxford: Oxford University Press. Vehling, J. 1977. Cookery and Dining in Imperial Rome: a Bibliography, Critical Review, and Translation of the Ancient Book Known as Apicius de re coquinaria: Now for the First Time Rendered into English. New York: Dover Publications. This entry was posted in Environmental archaeology, How do we know about Roman food?, Ingredients and tagged mulberry, Roman on October 9, 2014 by lisalodwick. Today I was very privileged to spend some time with Paul Roberts, Curator of Greek and Roman Antiquities, at the British Museum. We are hoping to borrow some objects from the British Museum for our exhibition at Corinium Museum next year. Today’s trip to the British Museum was the first step in this process: creating a wish-list of objects. In the British Museum glass reserves with Paul Roberts. One thing I do know is that if we do get some of these objects (fingers crossed! ), you will be in for a treat! This entry was posted in Corinium Exhibition and tagged British Museum, chamber pot, Corinium Museum, dining room, glass vessels on October 8, 2014 by zkamash2013. Yesterday we had our first meeting with the lovely (and very helpful!) staff at the Corinium museum to begin planning our Spring/Summer 2015 exhibition on Roman food. 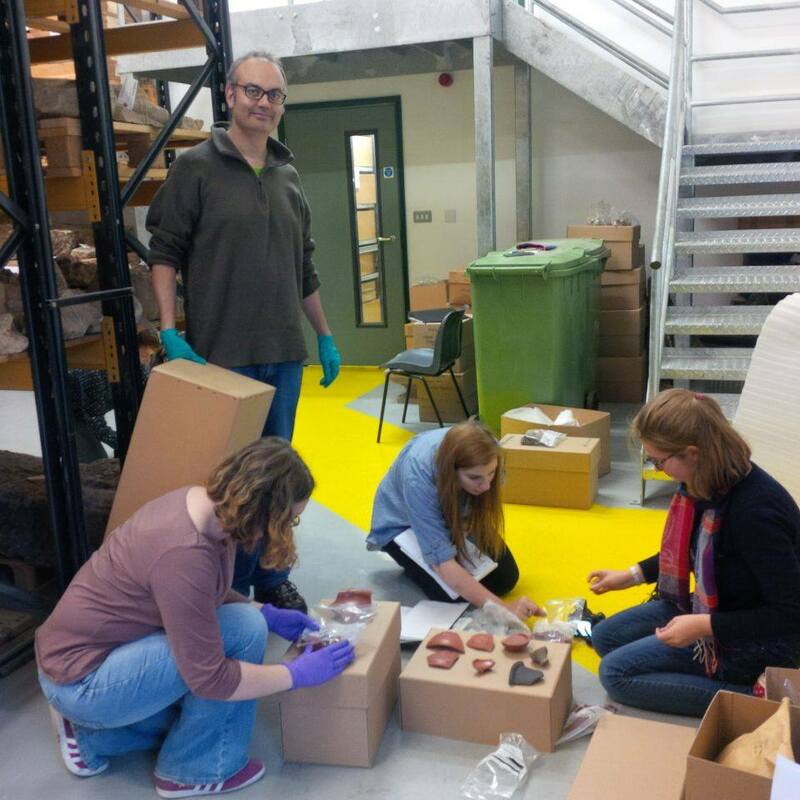 The collections team, composed of Alison Brookes, James Harris and Heather Dawson, told us all about their newly reorganized collections and the museum’s large storehouse at Northleach. We will be selecting objects from both the museum and the storehouse, along with some material on loan from the British Museum, to put on display. After planning a trip to check out the boxes of material at Northleach (a very exciting prospect for archaeologists) the meeting ended with a lively discussion about chickens and pine cones! 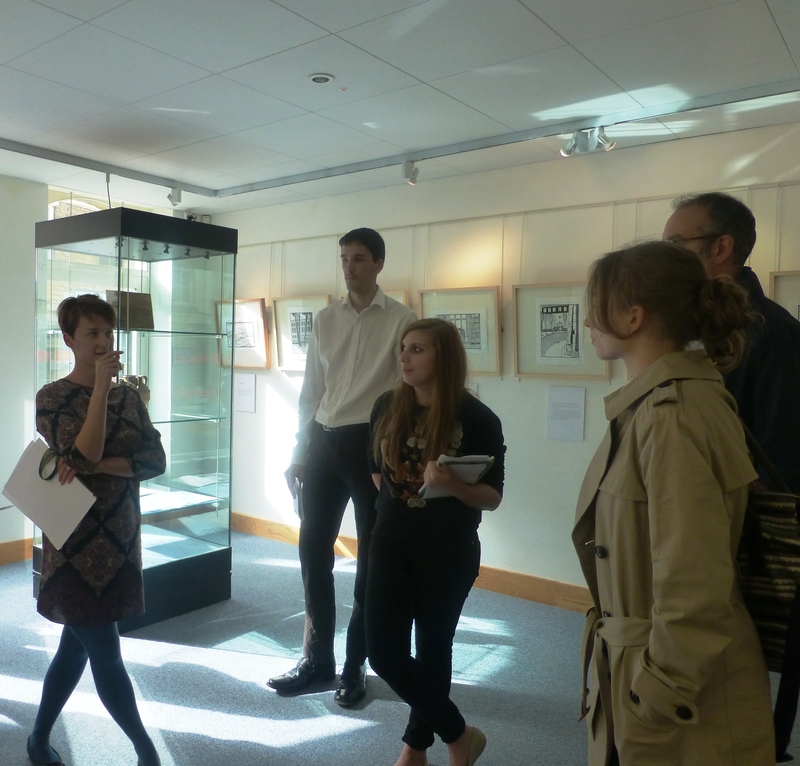 The team then took us on a tour of our exhibition space and we discovered that we have quite a lot of it. When all the important details such as panel space, glass cases and power outlet locations had been recorded, we were then taken on a tour of Corinium museum; and what a museum it is! The Roman section is extensive and they have an excellent display of all sorts of Roman objects from coins to ceramics to bronze spoons to mosaics. It is clear that the Roman town of Corinium was quite wealthy. The dioramas are simultaneously entertaining and informative (especially the full size Roman soldier on horseback and the man working in the butcher shop). We were then shown the reconstructed Roman garden that has recently been cleaned up by a dedicated volunteer. As part of our exhibition we hope to plant herbs that were used to flavour food during Roman times. Checking out our exhibition space. After the meeting, two of us food for thoughters (Erica Rowan and Lisa Lodwick) ventured to the nearby Chedworth Roman villa. That is a site definitely worth seeing, not only for the well preserved mosaics but also for its beautiful setting in the Cotswold countryside. We are heading to Northleach on October 22 and so stay tuned for a full report on our storehouse adventure! 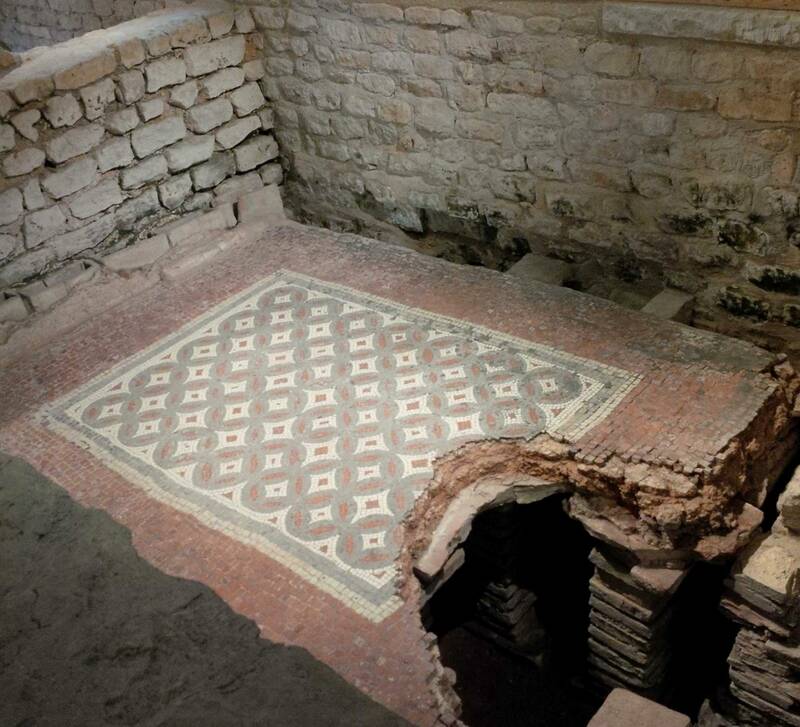 Mosaic from the baths at Chedworth villa. This entry was posted in Corinium Exhibition, Event and tagged Chedworth Roman Villa, chickens, Corinium Museum, exhibition, Northleach, pine cones, Roman food on October 3, 2014 by ericarowan.